According to the JP’s Sports & Rock Solid Promotions website this will be Andre Reed’s first JPRS Appearance. Show hours for Saturday, January 14th, 2017 are from 10:00 a.m. to 5:00 p.m. Admission: Adult $10.00 per day. Kids under 12 are FREE. Andre Reed is a former wide receiver for the Buffalo Bills from 1985 to 1999 who also played for the Denver Broncos and the Washington Redskins in 2000. During his career Reed achieved 13,198 yards receiving (4th all-time at retirement) with 951 total career receptions (12th ranked in NFL history). Reed was also a seven-time Pro Bowler from 1988 to 1994. In 2006, Reed was voted into the Buffalo Bills Wall of Fame and was inducted into the Pro Football Hall of Fame in 2014 after being eligible for 8 years. Reed was also elected to the Buffalo Bills 50th Season All-Time Team in 2009. PFP Sports & Celebrity Talent Agency is a top booking agent for motivational sports speakers and celebrities. 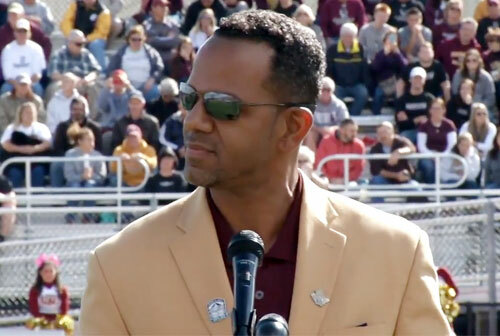 If you would like to book NFL stars like Andre Reed for a speaking engagement, personal appearance or special event, you can request Andre Reed agent and speaker information from PFP Sports & Celebrity Talent or call 800.966.1380.